Musings of The Carrot Flower...: Calvin. Part 1. The birth story of my little man starts with not with his birth but, instead, with the day we found out we were expecting. With Isla we tried for a good few months before getting a positive pregnancy test, so when we started thinking about adding to our family we were planning on it taking a while. So, the fact that I saw two pink lines the month we stop using contraceptives came as a surprise. I got out a little gift bag, put a sweet new newborn sleeper and the positive pregnancy test in the bottom of the bag and Isla delivered the gift to Ben in the morning. Ben pulled out the sleeper and said, "What sweet new PJ's for you Isla", he was obviously still tired so I said, "I don't think they will fit Isla, there is something more at the bottom." He pulled out the pregnancy test and said, "Really?" That was end of April. Then mid May Ben had a conference out at Rock Ridge Canyon, just outside of Princeton BC, and I decided I would join him. Boy, am I sure glad I did. I got there Saturday and woke up early Sunday morning with lots of discomfort, thinking maybe I had to go to the washroom. I tried, nothing. I felt like puking, nothing. 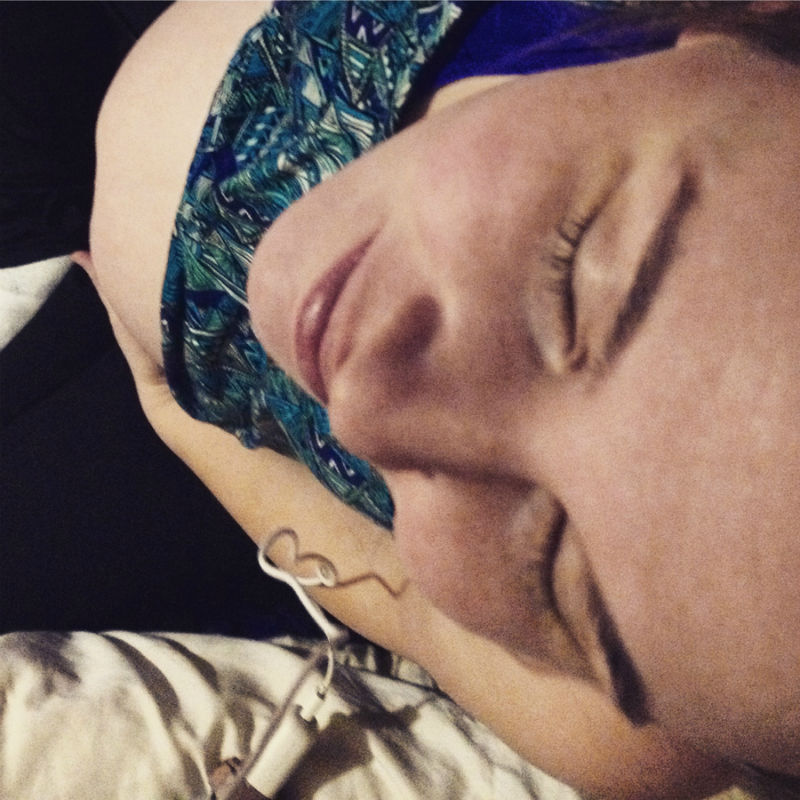 All of these feelings I took as normal early pregnancy symptoms. After nothing happening for an hour I went back to bed, maybe I could sleep it off. Wake up was at 8:00, Isla was still asleep and Ben wasn't hungry so I thought I'd go to breakfast alone, maybe eating would help. Unfortunately food was not something I wanted, I ate some but didn't feel like much and picked over what was on my plate. I headed back up to our room and had to stop three times, I was most comfortable hunched over. Ben went down to the main hall to listen to some speakers, this was a work conference, and I stayed in the room as Isla was napping. I was in a lot of pain and tried to go to the bathroom again, nothing. I called my mom and she said maybe I should go see a doctor, it could be an ectopic pregnancy. I gathered up Isla, getting her dressed and slowly made my way to the main hall. By the time I got there I was almost in tears I was in such pain. I walked into the room hoping to spot Ben and a nice middle age woman noticed me and asked me who I was looking for, "the doctor". She grabbed the doctor, who surprisingly she knew, and I passed Isla off to a friend as I went into the first aid room. There the doctor had me give a urine sample, still pregnant, and poked around my abdomen. Someone had finally found Ben and he and Isla met me in the room right as the doctor was saying I likely need to go to the hospital. Princeton Hospital, elevated white blood cells....Ambulance to Penticton Hospital. Ultrasound, baby is in the right place rules out ectopic pregnancy. Looks like Appendicitis. A family friend who lives in Penticton came and checked on us. It was actually quite perfect. Ben had forgotten they lived there and was texting back and forth with his parents and my parents to keep everyone informed (my mom was already on her way) and Ben's mom called Deanne, a close family friend, who dropped everything and came to the hospital. Deanne is a nurse and right away took charge, we were tired and in a daze and really had no idea what to do, she talked to the nurses and doctors and figured out what was going on and let us know. The surgeon came and talked me and, "Well we are going to do the surgery, we can't not as that wont end well for anyone. I do need to inform you that there is a high chance of miscarriage, I don't know percentages as this isn't something that has been studied but as with all procedures done this early in pregnancy there can be negative affects and you may lose this pregnancy." Hard to hear. We knew I needed this though so we prayed and then Ben headed off to Deanna's house. We were told it would likely be a few hours until my procedure. I guess I was bumped up in line because it wasn't fifteen minutes after Ben left that I was informed I was heading to the OR right away. Right as they were about to wheel me in Ben and Isla come in, Ben prays, we kiss...then into the OR I go. December 31st 2014, I had said the entirety of my pregnancy I was happy as long as my son didn't arrive on my birthday, January 1st, but it was 3:00pm and contractions had started. He was coming and chances were he was going to make an appearance on my Birthday.